First, let’s take stock of the players that are available. 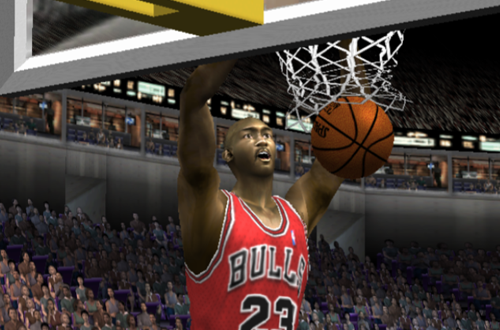 Michael Jordan is in the game, not only as a Legend, but as a member of the Wizards. Scottie Pippen is on the Trail Blazers’ roster. He’s joined in Portland by Steve Kerr. Jason Caffey is on the Bucks. Jud Buechler is on the Suns. Randy Brown is on the Celtics. Toni Kukoc is on the Hawks. Robert Parish is available in the Legends pool. Additionally, Horace Grant, Will Perdue, and Scott Williams, members of the first three-peat, are on the Magic, Trail Blazers, and Bucks respectively. Corie Blount, who briefly played with Jordan in 1995, is active on the Warriors’ roster. Charles Oakley is already in Chicago. 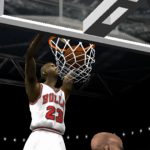 That makes eleven of Michael Jordan’s former teammates who are still active in NBA Live 2002, as well as MJ himself. Sign Robert Parish from the Legends Pool, and you’ve got a thirteen-man roster comprised of Chicago Bulls players from the Jordan era, only two of whom were not members of any of the championship squads. 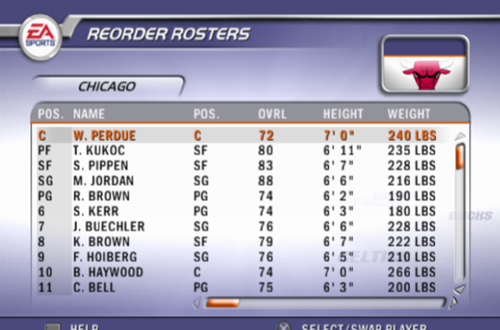 With Parish, you can also assemble a roster comprised of eight of the players from the 1997 Bulls. It’s a fun exercise while messing around with some roster editing, but the real challenge we’re aiming for today is reconstructing those Bulls in Franchise Mode, where the CPU can reject trade offers. I start a new Franchise game and save it before making any trades, in case I want to quickly start over. I decide that I’ll start small, and try to acquire the lower rated players first. Unfortunately, I’m not having much luck, so, I go ahead and trade Greg Anthony (78) and Ron Mercer (82) for Scottie Pippen (83) and Steve Kerr (74). Although my plan was to keep Charles Oakley (80), I end up trading him along with Ron Artest (81) and Jamal Crawford (79) for Michael Jordan (88), Tyronn Lue (76), and Brendan Haywood (74). It’s a lot to give away in one deal, but the Wizards understandably weren’t keen to let MJ go. Eddie Robinson (79) and Marcus Fizer (79) land me Toni Kukoc (80) and Matt Maloney (75). The Celtics accept a deal of Michael Ruffin (77) and Tyronn Lue for Randy Brown (76) and Kedrick Brown (79). I turn Brad Miller (78) and A.J. Guyton (74) into Jud Buechler (76) and Charlie Bell (75). Will Perdue (72) is acquired for Matt Maloney. It’s at this point that I reach an impasse. The players I still need to trade don’t have particularly high ratings, and their contracts are all very small. Even packaging them together isn’t enough to get deals done under the salary cap. Furthermore, for some reason, the Warriors are adamant about keeping Corie Blount. Still, I managed to acquire seven players who were members of at least three Bulls championships, including Jordan, Pippen, and Kukoc, all three of whom are rated 80 or higher. Although I was originally aiming to reconstruct the 1997 Bulls, had I been able to acquire Corie Blount instead of Randy Brown, I’d have actually assembled seven players from the 1995 squad. Acquiring Michael Jordan was, not surprisingly, the toughest trade to pull off. It was made even tougher by his contract, a hefty 200,000 Points (with 300,000 being the maximum). In real life, when Jordan made his comeback with the Washington Wizards, he signed for the veteran minimum. Matching salaries proved to be the biggest hurdle in this exercise. In most of the deals, I found myself having to give up a bit more than I’d like, in order to both offer the CPU the value it wanted and make the trade work under the cap. On their own, the Overall Ratings of the 2002 Bulls might have been good enough to make a couple of shrewder deals. However, a lot of their players have small contracts, including Ron Artest who for some reason has a minimum deal (30,000 under the Points system). I also ended up having to take on players who had small contracts of their own, which made them difficult to flip in subsequent trades. I decided that I’d try again. This time, Mercer, Fizer, and Ruffin were traded for Jordan, Popeye Jones, and Haywood. Oakley and Robinson were dealt for Pippen and Kerr. Fred Hoiberg was swapped for Brown. Miller, Anthony, and Jones were traded to the Hawks for Kukoc, Maloney, and Jacque Vaughn. Vaughn went to the Spurs for Mark Bryant. I traded Guyton, Haywood, and Maloney to the Clippers for Zendon Hamilton and Eric Piatkowski. Crawford and Piatkowski went to Milwaukee for Caffey and Michael Redd. I acquired Perdue for Bryant. After acquiring Dan Langhi, I traded him with Redd to the Bucks for Ervin Johnson, who along with Artest landed me Buechler. All of those deals resulted in me landing eight players from Jordan-led Bulls squads. I tried trading Brown and John Wallace – acquired from Phoenix in the Buechler deal – to Golden State for Blount, as that would’ve given me eight players from the 1995 Bulls. However, the Warriors were once again adamant about keeping him, so that idea fell through. Reuniting all the active members of either the 1995 or 1997 teams is close to impossible, to say nothing of acquiring MJ and all eleven of his former Bulls teammates. Still, with a bit of work, it’s possible to set up some reunions, even if it’s just the original trio of Michael Jordan, Scottie Pippen, and Horace Grant. Of course, the question remains, are the teams fun to play with? I would have to say that yes, they are. Obviously, there are players from the core rotation missing, namely Dennis Rodman, Ron Harper, Luc Longley, and Bill Wennington. However, if you leave Perdue on the bench and just run with Jordan, Pippen, Kukoc, Brown, Kerr, Caffey, and Buechler, it’s a little like a game from the 1997 season in which the Bulls suffered a lot of injuries through the course of the year. Despite being banged up, that team still won 69 games on the heels of winning a then-record 72 in 1996, and of course completed the “Drive for Five” in the Playoffs. Worth mentioning, I feel. 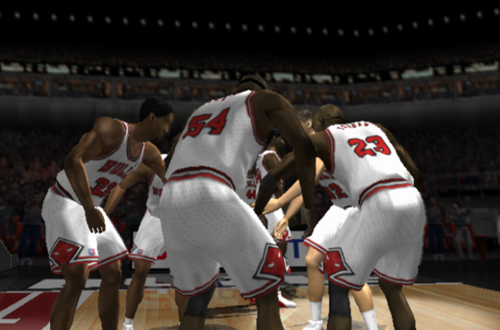 Having given it a try, I think that if I had reconstructed Jordan’s Bulls back when I was still playing NBA Live 2002 – even if it was just four or five players – I’d have created an enjoyable experience. Would it have held my interest as much as my Kings Franchise did? It’s hard to say. It’s certainly a gimmicky premise and in no way realistic, but sometimes, that can be a fun change of pace in basketball games. At the very least, I’d have found a similar satisfaction in the challenge of acquiring all the players, and my two all-time favourite players would be back on my favourite team. It might’ve indeed been worth a shot back then, so I’m glad that I gave it a try now. I would have thoroughly enjoyed this reconstruction back then. Nice one! I was on PS2 during that era so I missed out on Inside Drive 2002. I did pick it up for $5 on eBay a few years back as I had plans to check it out on my 360, but despite being on the backwards compatibility list, I couldn’t get it to work.